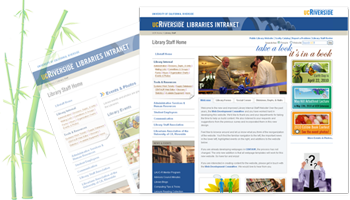 One project that I worked over the past few months was redesigning and creating content for the UCR Library Staff Intranet. It’s one of my favorite projects since I had a lot of control over design and content. I wanted this version of the website to be more in line with the campus websites, so it’s made from a basic template provided by the UCR campus. I was responsible for graphics, photography, layout, organization, content creation, and scripting/functionality. Many of the addition and changes went through a committee to approve as well. The website fully launched on May 24th, 2010, and minor updates are made to it everyday. The staff now have a site that they can enjoy as well as find tips, tutorials, and important information. This is the main front page of the website. Although it started from a template, I am responsible for creating all the graphics on the page as well as updating the events on the right side. The bottom “Did you know?” part is scripted so the content rotates though content in a database. This is the events and photos page. I got to use some of my photography skills at work to capture the events. Clicking on the images will take you to a gallery page where the photos are displayed using SimpleViewer. I had a little bit of fun on the Staff pages. If you enter a Staff name in the search box, it’ll display their information. I also added a fun field where they can enter their books widget to display their latest books (or whatever they choose). I’m currently using Shelfari’s widget as the default, but they’re more than welcomed to us a GoodReads or LibraryThing widget as well. The search script distinguishes between searching a person and searching for a page. In the above graphic, it displays what searching the website looks like. It’s a home-grown search engine that displays the familiar titles and links. This is the Available Equipment and Rooms page. It’s an example of content I created by simple observation of how things work around the Libraries. Daynah was given complete creative control of the redesign and was able to transform the website into an elegant and functional site based on the feedback and suggestions of the website’s primary clients, the Libraries’ employees. What is more important is the fact that Daynah is able to bridge a divide that most programmer analysts have difficulty with, that is to understand and listen to her customers needs. In addition, Daynah is also able to keep the broader mission of the UCR Libraries and the University in mind when she is working on a project. Ultimately the organization and layout of the new Library Staff Intranet will allow the employees of the UCR Libraries to be more efficient and productive themselves. WOW! I love it! Well done! I think the new site looks beautiful. What frameworks did you use to build it?